All transactions are safe and secure with a reliable history in online purchasing behind each of our associates. Buy the Rocky and Mick t-shirt to own Rocky clothing and merchandise. 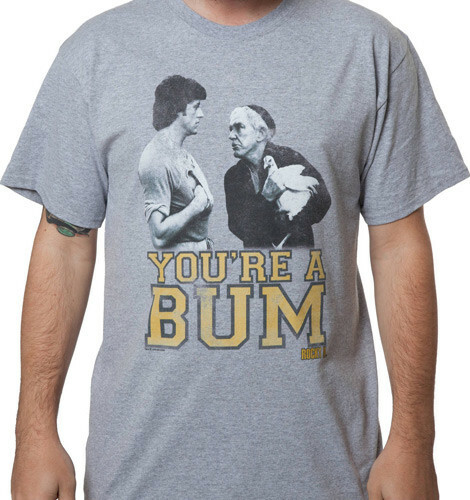 You'll be ready to eat lightning in this Mighty Mick's Gym Rocky t-shirt that declares, "You're a bum." It just might have you uttering a few "Yo, Adrians" once you try it on. The owner of Mick's Gym appears on the front of this tee, along with his undisciplined subject. Mick's Gym is where Rocky Balboa trained under the tutelage of Mickey Goldmill (Burgess Meredith). Eat lightning and crap thunder in this You're a Bum Rocky tee. In addition to the Rocky and Mick tee above, browse the Rocky Clothing Gallery for more apparel like men's and women's clothes, kids shirts or hoodies.